After a long Sunday of cleaning up at home, we went to Church and decided to have a treat for dinner. We headed to Jaya One, a new place at PJ which we heard had lots of new restaurants. We weren't sure where to eat so we looked around. We arrived at 645pm and when we passed by the Duck King Restaurant the ground floor was already full! Hubby and I decided to check the menu and the first page featured the Duck wrap which we were both craving for a long while now. 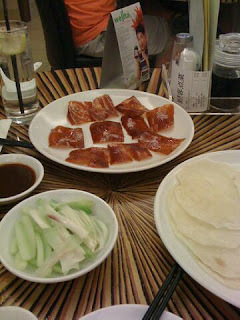 Our last fabulous duck wrap like that was 2 years ago back in Manila @ Peking Garden in Makati. We were not disappointed at all. Our half order of duck wrap was superb. 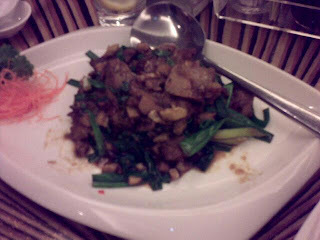 It also came with second way cooking, and the waitress recommended the Duck meat saute with ginger. 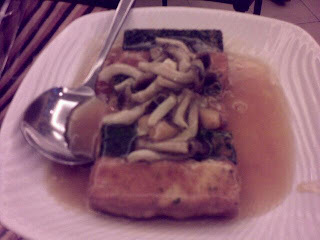 We also ordered one extra dish : tofu with mushroom, which was also tasty especially when paired with plain white rice. We ordered only 1 plain rice which seemed more than enough for 2 people. 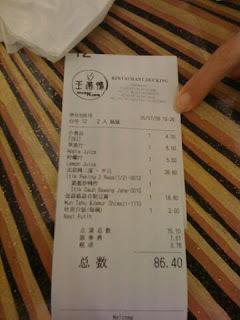 Overall the unexpected duck dinner cost around rm 86 for 2 people. We ordered 2 fresh fruit juice along with our meal. 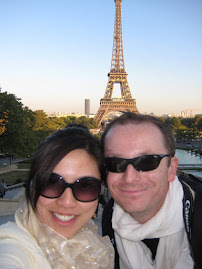 Will surely go back one day but not after a few months. Need to space out killer duck skin like that!